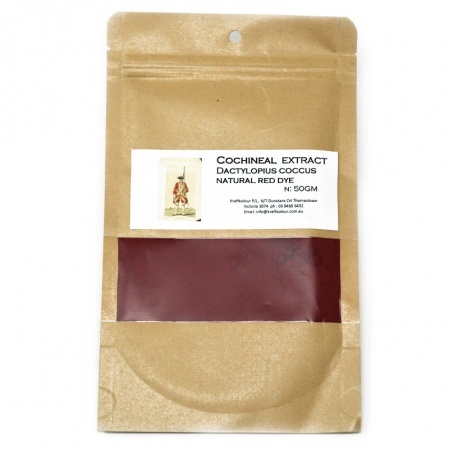 High quality Cochineal powder 70% dye content. Dyeing with Cochineal yields reds, scarlets and crimsons. Use only .5 to 2% of this powder WOF for medium shades.Use alum mordant at 15% WOF for protein fibres. Mordant with tannin at 8% WOF and then alum at 15% for cellulose fibres. Cream of tartar used at 6% WOF added tothe alum mordanting bath or the dyebath, you will give you Christmas red. Using ironat 2-4% WOF to either the mordanting bath or the dye bath thecolour will give you purples. Cochineal is very sensitive to PH so adding some Acid (white vinegar) will shift the colour to oranges. Adding some Alkali (Soda Ash) will shift it to deep fuchsia. Before 1856, Natural dyes were used in time honoured techniques (as far back as 1500BC) but once synthetic dyes were invented in 1856, textile dyers and artisans moved from traditional natural dyes to synthetic dyes to colour their cloth and fibre. They will dye any natural fibre using a handful of non-toxic mordants and additives to help fix the dye and also give you more colour variations. 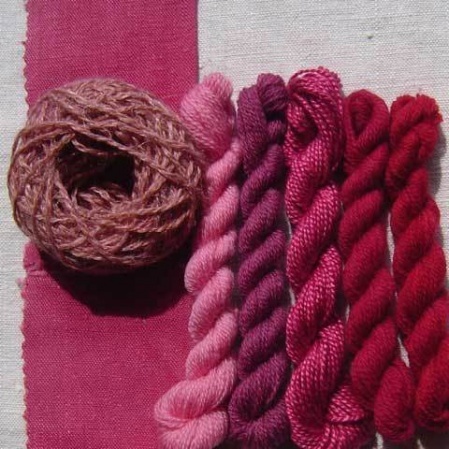 Natural dyeing is very much about reconnecting with the past - apart from using the plant materials you have at hand in your own garden, there are a number of traditional Natural Dyes and extracts including Indigo, Madder, Cochineal and Fustic.